Synopsis: ‘YOU’RE THE LAST OF THE WEREWOLVES SON. DON’T FIGHT IT . . . CONQUER IT.’ When the air is clear, sixteen year-old Drew Ferran can pick up the scent of a predator. When the moon breaks through the clouds, a terrifying fever grips him. And when a vicious beast invades his home, his flesh tears, his fingers become claws, and Drew transforms . . . Forced to flee the family he loves, Drew seeks refuge in the most godforsaken parts of Lyssia. But when he is captured by Lord Bergan’s men, Drew must prove he is not the enemy. Can Drew battle the werecreatures determined to destroy him – and master the animal within? 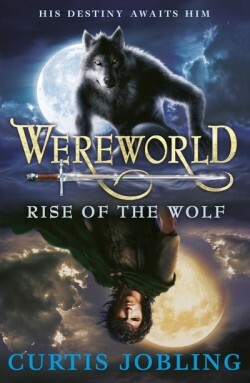 Wereworld: Rise of the Wolf is one of the few “proper” high fantasy, medieval novels I’ve read this year. I’ve read plenty of fantasy novels, but I haven’t read something quite like this in a while (blame the publishers – they’re forever sending other books!) It’s nice to return to the genre that originally encouraged me to read back nearly 5 years ago when I discovered Eragon, the bestselling fantasy novel by Christopher Paolini. In many cases, Curtis Jobling’s debut YA novel is very similar to Eragon. For a start, as with many books of the genre, it all starts with a normal farm boy living a wonderful life until, all of a sudden, he discovers he is destined for greater things in a speedy turn of events (normally involving the death of a close relative, which happens, incidentally.) Then, of course, there’s the shared love for medieval history. Swords, bows and arrows have to make an appearance, otherwise it just wouldn’t be epic fantasy. And, to top it all off, there has to be an evil king that needs killing. Many fantasy novels share that basic structure for good or for bad, and Wereworld is no exception. In many ways, Wereworld is just another high fantasy aimed for the 12+ market who will no doubt guzzle it up. This is its primary weakness because Wereworld suffers in all the places one would expect after reading novels like Eragon. Most notably is the characterisation. Bad characterisation is one of those things that will always plague epic fantasy. Whether this is due to the authors’ concentration on world building or if they are just generally not a character-related author doesn’t seem to matter – nine times out of ten, these kind of novels suffer from poor characters. Wereworld is no different. Right from the start weak dialogue is present. Perhaps not weak but bland, to the extent that every character sounds the same. There doesn’t seem to be much personality showing through. Every father figure says ‘lad’ or ‘son’ way too often, and going just by dialogue, differentiating between the young male leads is difficult. The characters just don’t possess their own voice, and this is Wereworld‘s greatest (and nigh on only) downfall. Looking beyond this; Wereworld is actually a decent novel. Curtis Jobling has come up with a good idea and has a good way of telling it (as you would expect from someone with credentials like his: he was the developer of hit kids’ TV show Bob the Builder). The story, while slightly predictable at times, is solid and holds out right to the end (an end, which I might add, reminds me incredibly of Frodo’s time of healing in Rivendell in the film adaptation of The Fellowship of the Ring…), and is adventurous and action packed. World building is effective, and this werelords concept is quite intriguing, although a bit underplayed I felt. If you can ignore the somewhat bland and cliched characterisation, and enjoy high fantasy novels on par with Eragon, then Wereworld: Rise of the Wolf is a definite must. Overall, as a first novel (and particularly as an epic fantasy novel – one of the hardest genres to write well in, in my humble opinion), Wereworld is a solid debut by the experienced childrens’ entertainer Curtis Jobling. I look forward to reading the second novel in this series, which I hope can work on some of the flaws raised here. What did you think about Wereworld: Rise of the Wolf?